According to the nature of the mountaineering is divided into adventure, competitive professional, fitness three, sometimes expanding training will have the operation of outdoor climbers have appeared at the foot of the mountain, enjoy the beauty of climbing, but also exercise the body. 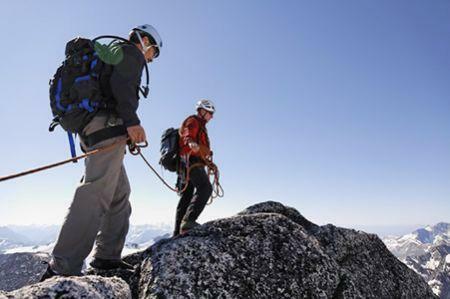 No matter what the nature of mountaineering, have a good set of mountaineering equipment will make you more effective, to ensure time-saving and labor-saving and safe. Here are some of the mountain climbing equipment and mountain climbing precautions. Outdoor travel, an intimate backpack essential, can be regarded as the first equipment to travel. In the choice of backpack, carrying the system seems very important. A set of ergonomic carrying system, comfortable, breathable, non-slip wear, can effectively distribute the pressure, reduce shoulder, vertebral burden. At the same time, backpackers are generally equipped with multi-storey storage space, allowing items to be placed in an orderly manner, and easy to take, such as can also be equipped with a rain cover the best, even in the rainy weather, do not worry about rain wet Your items. Backpack is definitely an indispensable partner on your journey. No matter what kind of weather, as long as you choose outdoor sports, before departure remember to bring a windproof, waterproof, cold jacket, which is essential equipment. SUPER-TEX, DENTIK fabric with PTFE waterproof and breathable film provides good windbreak, waterproof and breathable performance. It effectively expels the sweat and heat generated during exercise and keeps the body dry and comfortable. Choose a good performance of the Jacket, you can drowsyly indulge in outdoor charming scenery, no longer have to worry about the volatile weather. If you plan to camping outdoors, then tents, sleeping bags are a must. Tents currently on the market for sale are single, double, triple and quadruple. Including 2 to 4 of the tent is the most intimate, suitable for young friends travel together, the tent's internal space is relatively large, usually two doors and two foyer, the effect of ventilation is also very good, activity extension Larger. Determine the type of tent selection, but also depends on the tent fabric has good waterproof, wear-resistant properties, at this time the best choice of double tents, the internal air permeability to ensure that the tent air circulation. In addition, if you are outdoor sleeping in the spring and autumn, due to low temperature, take a sleeping bag is a good choice. At the same time the foot is one of the most prone to sweat during exercise, and those outdoor shoes that are waterproof and have breathable functional fabrics are a good choice. This shoe helps to perspiration, breathability, keep your feet dry, greatly enhance your comfort in the journey. Mountain climbing camping activities on the human body has great benefits, its vision, cardiopulmonary function, limb coordination, consumption of excess body fat, delay the human body has five direct benefits such as aging.